This premium upholstered 2-way infant carrier allows baby to face in for soothing sleep, or out to explore the world! Soft, breathable mini-vented lining give baby a cool, padded and comfortable ride. 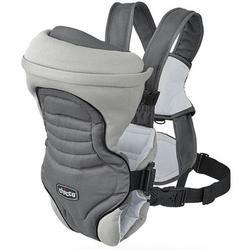 The carrier also features adjustable padded leg holes for maximum comfort in both positions. Easy adjust side clips open completely so you can access the baby without disturbing her sleep. A cozy zip-on hood keeps baby’s head covered and warm when facing in. Padded shoulder straps, bi-directional adjustable side straps, and padded upper back and lumbar support help to provide a more comfortable fit for parents. Recommended for babies from 7.5 - 25 lbs.